We offer custom-made and custom-fitted braces for all major body parts, using top quality global bracing companies. 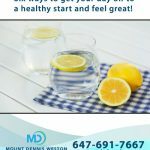 At Mount Dennis Weston Physiotherapy and Chiropractic Centre, we are proud to provide the best quality braces on the market. The most common braces we provide are for the lower back, knees, ankles, wrists, elbows and shoulders. 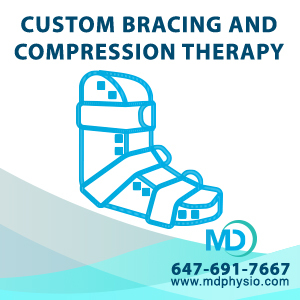 During your appointment we will take a number of custom measurements, then order either a custom-made or custom-fitted brace to suit your needs, whether it be for sports, work, or for daily use. Braces are typically used for joint instability, pain, arthritis and post surgical recovery. The braces we provide are all light-weight, highly durable and extremely comfortable. The braces are fitted and prescribed to patients by our chiropractors and physiotherapists. 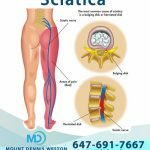 We also offer top quality medical grade compression therapy socks and stockings, which are also custom fitted based on numerous measurements. We offer a variety of styles and therapeutic compression gradients based on your needs. The most common purpose for compression therapy stockings and socks is for management of varicose veins, venous insufficiency, and puffy and swollen ankles and feet. They are also commonly used for people who fly often, and during pregnancy. 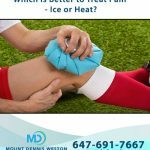 Your chiropractor, physiotherapist or medical doctor will likely advise you on which level of compression is best suited for your needs.